Saskatoon, thank you very much for your support over the past month. Unfortunately, due to dramatic weather changes from too cold to too warm, we have had to close our New Winter recreational area. We were open 28 partial or full days and were very happy with the positive comments from visitors. We are thankful to those whom did visit Optimist Hill as we were in a construction zone and doing the best we could with a new operation and new staff. The positive suggestions from the public to make their experience better were much appreciated and we will work hard during the off season to ensure we are totally set up for the next season. PLEASE NOTE: Optimist Hill is still a Construction Zone and as such is off limits to visitors while we complete our construction design and reseeding the entire park area that was under construction in 2018. We appreciate your understanding here and as that you stay out of the fenced in area/construction zone. Free Tobogganing Area: Will NOT be open until next season due to construction. No outside sleds or toboggans will be permitted in the park. Sorry for any inconvenience. Children (5 & under) Free! Children must ride in their own tube attached to a parent or guardian. AS A WINTER RECREATION AREA, OPTIMIST HILL'S FACILITIES OFFER A FULL RANGE OF ACTIVITIES FOR CHILDREN AND ADULTS. THE CENTRAL LOCATIONS AND AFFORDABLE EQUIPMENT RENTALS MAKE OUTSIDE PLAY EASY AND ACCESSIBLE FOR EVERYONE IN OUR COMMUNITY. WINTER OR SUMMER, OPTIMIST HILL OFFERS SETTINGS FOR A RANGE OF OUTDOOR AND INDOOR ACTIVITIES. While we will open in stages, the area is still surrounded by a construction fence, as the entire area continues to be a construction zone. Only areas that are open for use are to be used and those areas will be clearly marked and signed. From the start we planned a staged opening of the amenities. We are please to announce that both the ski/boarding hill section, the terrain park and the tubing lanes will be open first. Unfortunately the free toboggan hill area remains a construction zone and is unsafe to use at this time, so it will not open this season due to more construction that is required. We are sorry for this inconvenience and refer you to other tobogganing that is found around the city, at numerous places, like Pest Hill. DONATIONS OF $500 OR MORE RECEIVE PLAQUE RECOGNITION ON OUR PERMANENT SPONSOR WALL! WHEN YOU SPONSOR A TUBE, YOUR BRAND WILL TRAVEL UP AND DOWN THE HILL HUNDREDS OF TIMES A MONTH! 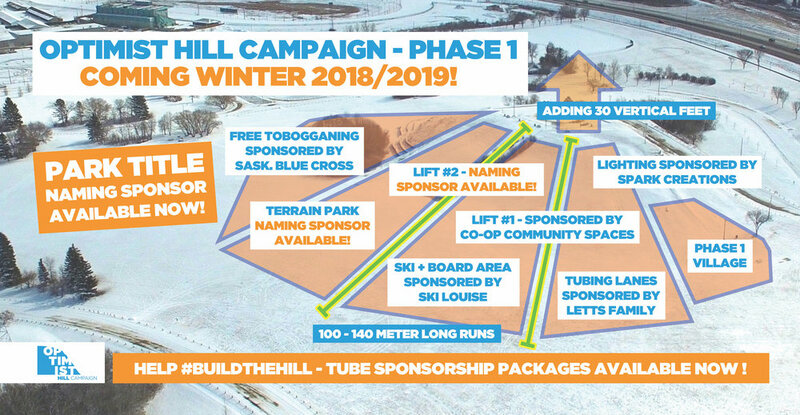 YOUR SPONSORSHIP WILL ALSO HELP TO PROVIDE THE COMMUNITY WITH AN AFFORDABLE RECREATION CENTRE THAT EMBRACES OUR LONG SASKATCHEWAN WINTERS AND ENCOURAGES KIDS AND FAMILIES TO BE OUTSIDE AND ACTIVE! *BASED ON 1 COLOUR LOGO PRINT - ADDITIONAL COLOUR OPTIONS AVAILABLE. LOCATED IN Diefenbaker park, SASKATOON, SK.